Green Frog 7 PAK. Steam Special Collector’s Edition. This show is also sold separately. This show presents the films of Gene Miller. They are 16mm format, and mostly color. 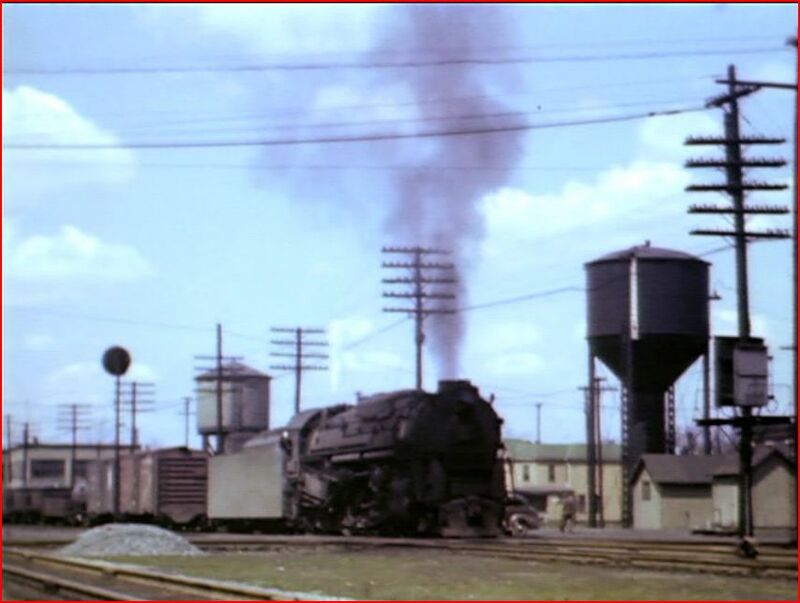 Pennsylvania Railroad, is the main feature in this show. There are numerous trains and locomotives. The West End, is Chicago, St. Louis and Terre Haute, Indiana. The final chapter has many other railroads shown. These were all filmed about 1945 to 1950. This timeframe, in 16mm color is definitely, rare indeed. High production values enhance this experience. 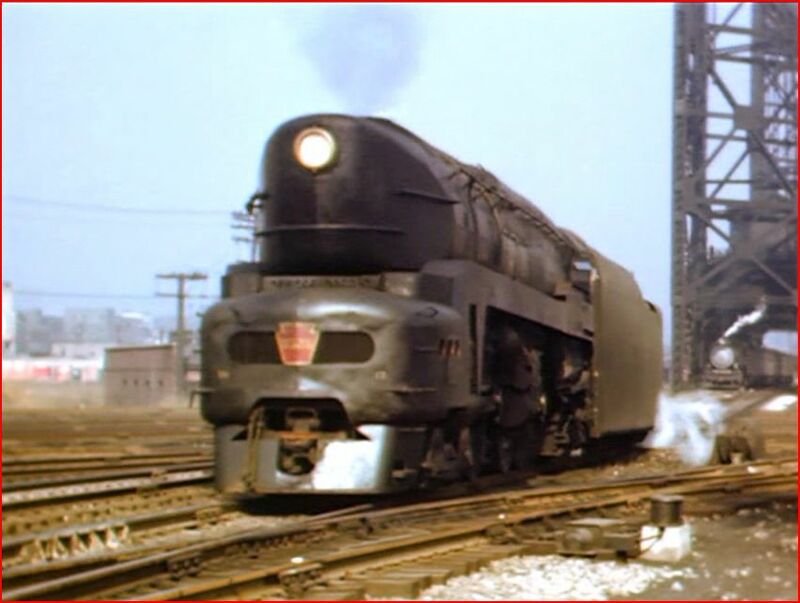 Green Frog Productions has a spectacular collection of steam power, in this 7 DVD collection! These shows are available in this convenient package deal. Another choice is to acquire them individually, as they are available separately. They are in a sturdy plastic housing in the set. A well-designed interior, has durable plastic divider pages, which hold the DVD’s securely. Each disc has a similar white label with show information. It is a compact method to store the 7 programs. Each program will be reviewed individually. A roll-up review of the entire set will be presented. Gene Miller was using the expensive 16mm film format, in the postwar years. At 75% color footage to black and white, it is all clearly shot film. The Gene Miller shows are presented in three volumes of The Twilight of Postwar Steam series. He covered many railroads. This volume features The Pennsylvania Railroad: West End, and it’s neighbors. To give you an idea of the imagery in this program, see the screenshots in this review. His cinematography is outstanding for the time period! There is a main menu with some good choices. A chapter menu divides the films by locations. Audio has a narration, on/ off selector. The audio is switchable, ‘on the fly’ with your remote! Dolby Stereo sound and digitally processed. High data bit rates for finest quality picture. Yes, the film quality is excellent. 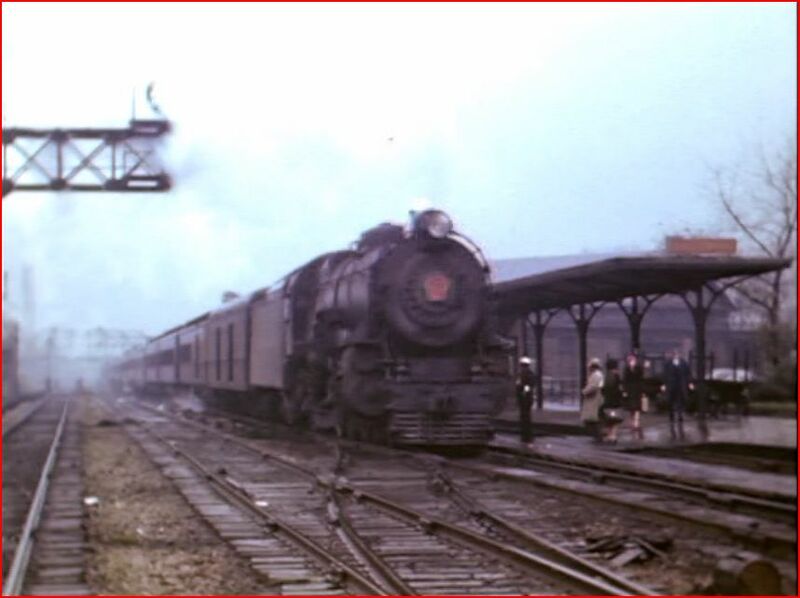 Pennsylvania Railroad was known as ‘The Standard Railroad of the World’, in it’s heyday. After watching this program, that is hard to dispute. Fortunately, Mr. Miller had a great selection of Pennsy locomotives to shoot. He also possessed the right equipment, and talent to capture many classic scenes.The man was not just limited to steam either! The show is well narrated by Larry Kohlhoff. Script and narration are very informative. Locomotives and locations are scene standards here. Additional information conveys some backstoy behind action The callouts come quickly, as the show moves quickly. At times, the info is very simplified. More detail is evident on the Pennsylvania scenes. General audio sounds are dubbed train sounds. The stereo soundtrack sounds fine. The action is non stop, and the pace moves quickly. The introduction shows the film qualities. The No Narration has just the train sounds for a soundtrack. It is a pleasing alternative, and a different experience, to view in this manner. Englewood, Illinois has an exceptional array of Pennsylvania Railroad at work. Steam power in a seemingly unending array of types. Classes include: K-4, T-1, M1A, 0-8-, 0-6-0, H-6, H-10. Early diesels in fresh paint from: EMD F3, F7, E7. Tuscan red Alco PA’s. Fairbanks Morse Erie Built, and Baldwin Centipedes are seen. This fully loaded chapter is a show within the show. Fascinating for the time, and an excellent presentation. Doubleheaded K-4 locomotives at Englewood. Alton Jct., also known as the 12th Street Crossing is another featured location. This was next to the drawbridge, and near Chicago Union Station. PRR K-4’s are seen here. This is mid 1940’s, in color! 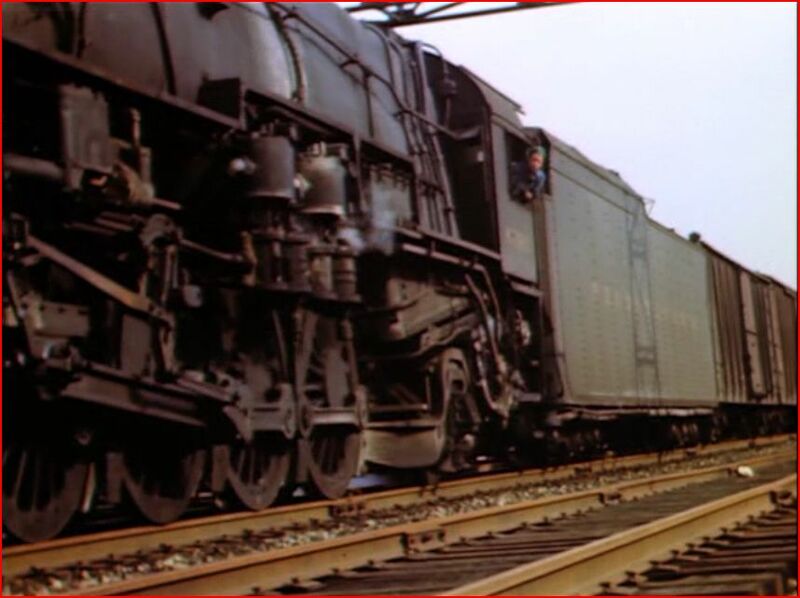 Full passenger trains, and light engine moves are seen.The PRR T-1 Duplex class as well. Note the weathering on T-1’s, as diesels are ‘the future’ of the railroad. Terre Haute is another Gene Miller favorite. A 2-10-4 is in a state of extreme wear. The steamers were in heavy usage during World War 2. This locale has classic old buildings. Model Railroaders would love these Terre Haute scenes! A T-1 steams slowly out of town. Nice closeups of the Duplex slipping, as they were known to do. Dual K-4’s are great! Above, a 2-10-4 at Terre Haute. This chapter has a great railroad feel, with many period structures surrounding the tracks. St. Louis provides even more intriguing Pennsy action! Clean appearing T-1’s are present. TRRA switchers are classic looking steam. Chicago’s Dearborn Station offers Grand Trunk Western. A GM&O RS-1 in original paint. C&O has some fine steam, such as an A3 2-8-2 on a coal drag.. Southern 1317 in green livery. 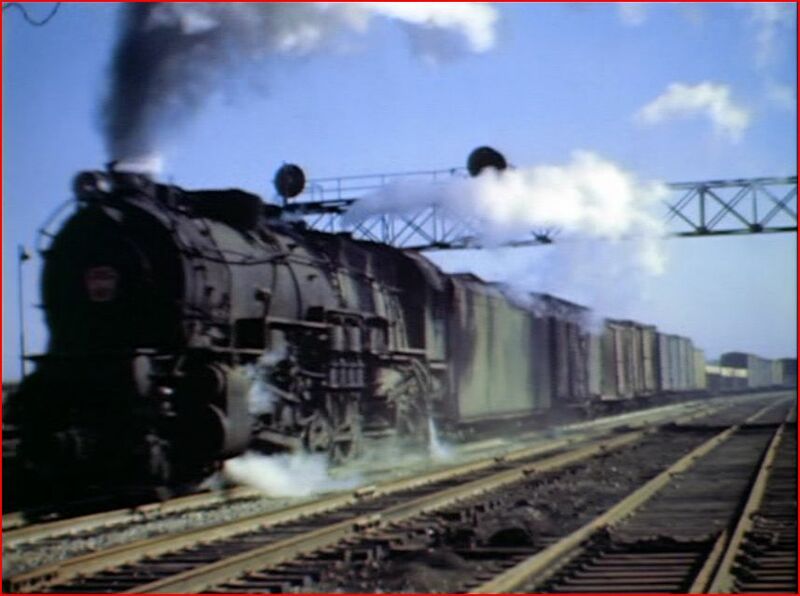 Chicago & Western Indiana switchers, with 0-8-0’s. DMIR 2-8-8-4’s with iron ore in Minnesota. 0-10-0 switchers too. 2-8-8-2’s on ore trains. Black & white film, it is really good. Chicago and color again. 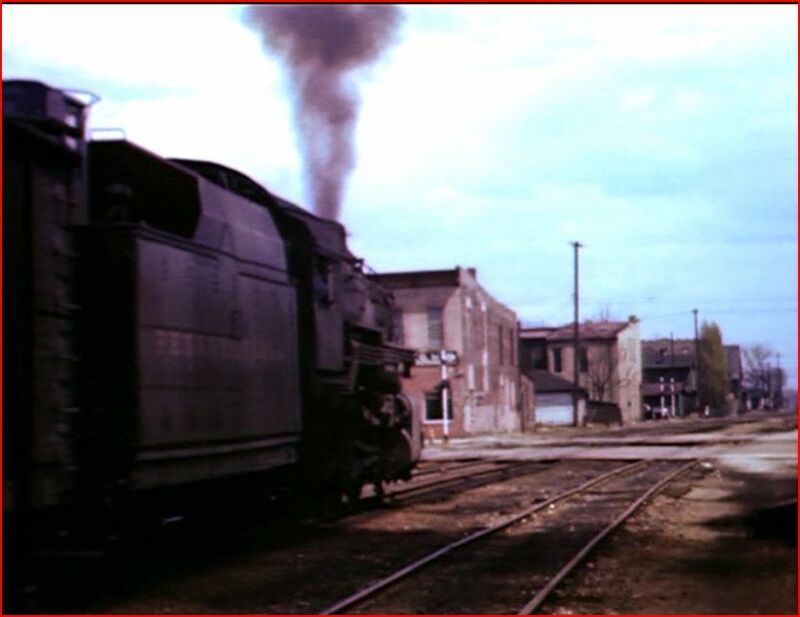 Erie steam, Monon F3’s with a passenger train. 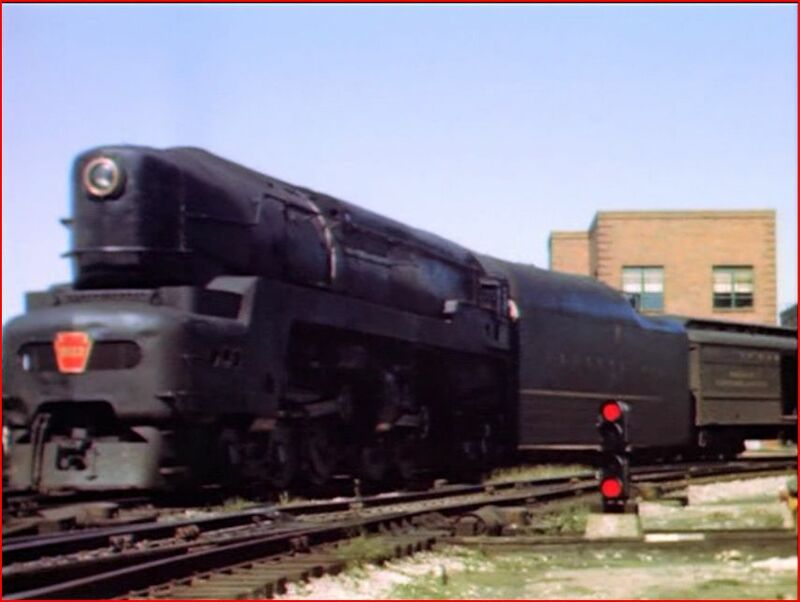 A large, Belt Railway of Chicago steam switcher. Clearing Yard in the steam era! Chicago Great Western, Chicago Northwestern, operating with steam. Toronto Hamilton and Buffalo at Buffalo. Milwaukee 2-8-0 Consolidations, 4-6-4, and more! Wabash steam at Dearborn Station. L&N steam and diesel. Emery Gulash fans will find this assortment satistfactory , with the familiar 16mm format. The Golden Twilight Of Postwar Steam: Volume One- The Pennsy’s West End and It’s Neighbors. 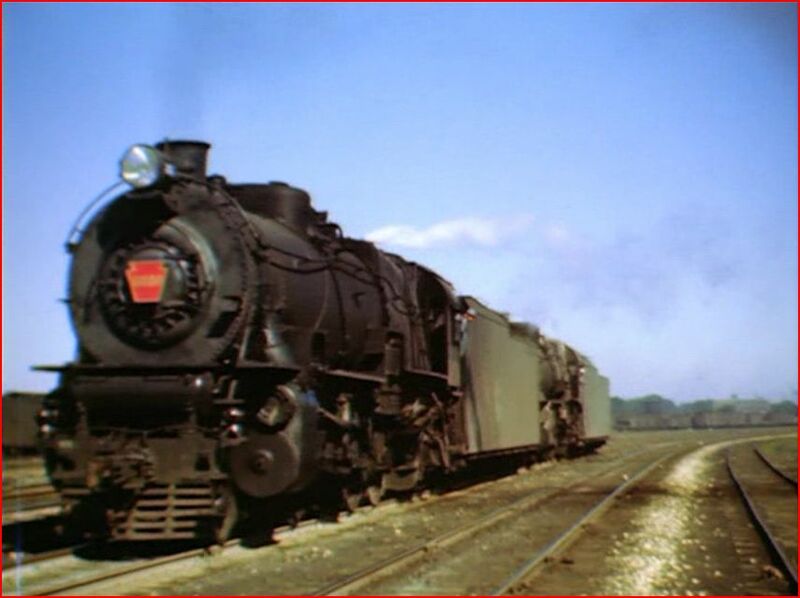 Green Frog has a cornucopia of vintage steam action, in this outstanding program. This show is impressive, and a ‘must have’ for steam fans. 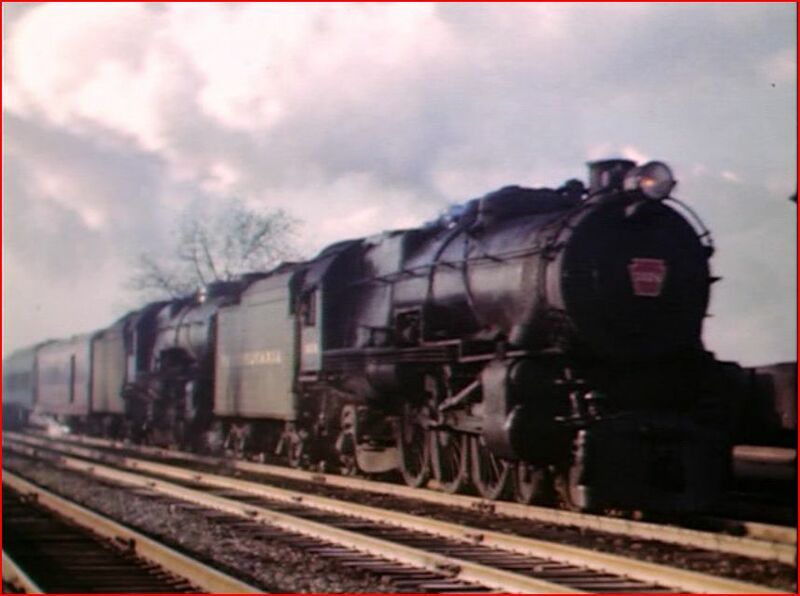 This entry was posted in ATVR Reviews, Green Frog Prod., Steam Train Reviews and tagged American Train Video Reviews, C&O, Chicago railroad, Grand Trunk, new releases, Pennsylvania, Railroad, Steam, Steam engine, steam train, Train DVD, transportation by William J. Hudson. Bookmark the permalink.